The easiest way to get a UK IP address is with a VPN. We'll show you the best VPNs for UK IP addresses which are suitable for streaming, offer great privacy and security features and perform well in our speed tests. There are a variety of reasons why you might want an IP address from the UK. British holidaymakers or expats living abroad might want to access news, TV shows, and movies on UK Netflix, ITV Hub, BBC iPlayer, and All 4. Or perhaps you may want to unblock British sporting coverage on Sky Sports or BT Sport. Those with UK bank accounts with Barclays, Natwest, Lloyds, and HSBC, might also need a British IP address to avoid being flagged by security regulators. 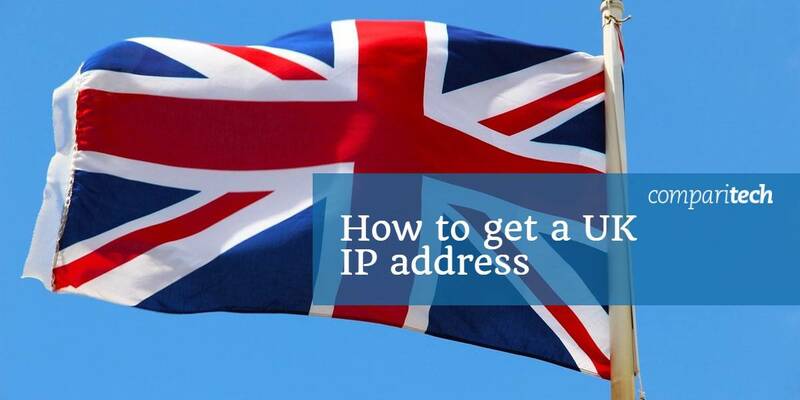 In this guide, we’ll teach you how to safely and securely acquire an IP address from the UK. The easiest and quickest way to do that is by using a Virtual Private Network (VPN). A VPN is basically software that encrypts all the traffic flowing to and from your device and routes it via an intermediary server of your choice. By choosing a VPN service that offers servers in the UK, it’s possible to make it appear that you’re actually located in the country. As we mentioned, the most efficient way to obtain a UK IP address is to sign up for a VPN. Paid VPN services offer a robust range of server locations. Selecting one that’s stationed in the UK will make it appear that you’re accessing the web from that region. ExpressVPN Easily tops this list with plenty of servers in the UK that are tuned for fast and secure performance. Top notch privacy and apps are easy to use. 30-day money back guarantee. NordVPN Budget performer that punches above its weight for speed and security. Plenty of servers in the UK. CyberGhost Another low-cost provider that offers solid security features and fast servers. IPVanish Ideal for privacy and torrenting, but not the first choice for streaming. Allows 10 simultaneous connections. PrivateVPN Small server count but achieved good speeds in our testing. Ample privacy and security. It’s easy to get a US IP address. Proceed to register for the service and download the app relevant to your device. We recommend ExpressVPN. Launch and log into the VPN mobile app or desktop client. Now you have a UK IP address and can browse the web at your leisure. TIP: HOW TO GET A GREAT PAID VPN FOR FREE: Not everyone will need an IP address from the UK for a long period of time and hence may be unwilling to splurge for a year-long commitment or more. If you’re simply traveling for a bit and need a VPN for a brief period of time, we recommend that you take advantage of ExpressVPN’s 30-day money-back guarantee. You will need to pay upfront by signing up with a valid credit card but the company offers a full refund if canceled within the first 30 days. We haven’t heard of any instances where this commitment was not adhered to so it’s pretty much risk-free. It doesn’t matter where you’re located in the world – it could be the US, France, Germany, Canada, Australia, India, Singapore, Thailand, or elsewhere – the process to obtain a UK IP address is the same. Best VPNs for a UK IP address? ExpressVPN is a top all-rounder. It offers reliable service and fasts speeds, along with top-notch customer support. At the moment, the company offers more than 1,500 high-speed servers spread across the globe. There’s a sizeable list of options in the UK and more in North America and parts of Europe. One of the provider’s distinguishing features is its ability to unblock geo-restricted content including Netflix, Hulu, BBC iPlayer, Sky, and more. ExpressVPN makes use of military-grade encryption protocols which go a long way in firming up your connection and quelling any attempts to pilfer your data. It leverages 256-bit AES-CBC as the default encryption standard as well as HMAC authentication and perfect forward secrecy. An internet kill switch is included, which it refers to as a ‘network lock’. The best part is that these rugged protocols don’t deteriorate speed parameters at all. The company doesn’t store any detailed traffic logs on its servers. It does retain a sliver of metadata, but that’s to improve the quality of the service, and user IP addresses are never recorded. ExpressVPN is incorporated in the British Virgin Islands which means it’s out of the jurisdiction of government authorities in both the US and the UK. BEST VPN FOR A UK IP ADDRESS:ExpressVPN is our Top Choice. Leads the way for unblocking most popular UK streaming and sports services. Exceptional speeds for buffer-free HD viewing and total security and privacy. Try it risk-free with the 30-day money back guarantee. NordVPN operates 532 servers in the UK, within a global network of more than 4,500 across 62 countries. It’s a fast, secure service that’s been offering VPN solutions for over a decade. This provider should have no problems with unblocking geo-restricted content. It’s also one of the rare services that allow users to select a server based on how they’d like to access the web; this includes streaming TV, ultra-secure privacy, anti-DDoS, and more. Encryption standards are robust. The service uses the 256-bit AES protocol by default coupled with 2,048-bit SSL keys. DNS leak protection is enabled. NordVPN doesn’t log user data or any form of personally identifiable information so your digital footprint will remain hidden. BEST BUDGET VPN:NordVPN is a good value all-rounder. A great value option which unblocks most UK sports and streaming services. Great privacy and security credentials. 30-day money back guarantee. CyberGhost has firmed up its service in recent months, especially after its acquisition by Crossrider – an Israeli firm registered in the UK. At the moment it offers a choice of 286 servers in the United Kingdom, part of a global network that numbers 2,280 servers sprinkled across 60 countries. We recommend the VPN solution for its budget-friendly pricing, fast service, and impeccable encryption standards. Other nifty features which are available at no extra cost include an ad blocker, anti-malware defense, and anti-tracking. CyberGhost is able to reliably unblock a bunch of geo-restricted content including Netflix. That puts it in an elite category of VPNs. All traffic is secured by 256-bit AES encryption on the OpenVPN protocol by default along with perfect forward secrecy. An internet kill switch is included. The company is headquartered and registered in Romania. As such, it isn’t subjected to any mandatory data retention laws. It firms up the privacy angle with an internal policy of not storing any user data. BUDGET CHOICE:CyberGhost is great for beginners. A budget choice with hundreds of servers to choose from in the UK. Works well with most popular UK sports and streaming sites. Stores no logs and streams HD video reliably. 45-day money back guarantee. IPVanish operates 85 servers in the UK. Its total global network comprises over 1,000 servers spread across more than 60 countries. The service is fast, private, and has minimal downtime. IPVanish works seamlessly with BBC iPlayer, HBO Now, Amazon Prime Video, and Sling TV. Encryption standards are in the top-tier. IPVanish uses 256-bit encryption on the OpenVPN protocol by default, SHA512 authentication, and a DHE-RSA 2,048-bit key exchange with perfect forward secrecy. It stores no data other than when an account is registered for the first time, which puts it in a similar vein to NordVPN. LARGE NETWORK:IPVanish works with up to 10 Connected devices. Great for families and multiple connections. Can’t unblock as many streaming services as some of its rivals. 7-day money back guarantee. PrivateVPN has a relatively small choice of servers compared to the other recommended services on our list. But that doesn’t mean the service is sub-par. In fact, PrivateVPN is so confident about its product that it’s able to offer a 30-day money-back guarantee to all users. The company offers a total of four servers in the UK. Globally there are just over 80 in 56 countries. PrivateVPN has an impressive ability to unblock popular streaming services including Netflix, BBC iPlayer, ITV Hub, and lots more. An additional reason to opt for this provider is that its speed and privacy ranking, as judged by our extensive user review, was at par with the other providers mentioned in the article. PrivateVPN uses the industry-leading 256-bit AES encryption along with perfect forward secrecy on the OpenVPN protocol. An internet kill switch is offered too. The service doesn’t store any user logs or engage in data mining of any nature. Can I use a free VPN for a UK IP address? One of the basic reasons for opting to use a VPN is the reassurance that your digital footprint will remain secure as long as you stay connected to a VPN server. After all, that’s why the software was developed in the first place: to keep yourself hidden on the internet. We’re aware that free VPN services are heavily advertised on app stores and elsewhere across the internet, but the experience they offer is shoddy, unreliable, and not worth your time. Free VPN services ship with a ridiculously small choice of servers, deploy feeble encryption standards, regularly indulge in bandwidth throttling, and, in some cases, mine your data to sell for a profit. We’re not saying it’s impossible to get a UK IP address with a free VPN but it’ll be very cumbersome and may require a fair bit of trial and error. Having said that, you should know such services are registered businesses. They need to make money to pay for staff salaries, the cost of maintaining servers, and other business overheads. A free product should raise eyebrows because there’s definitely a catch involved. Some will bombard you with migraine-inducing popup advertisements or insert tracking cookies and sell your personal data to advertisers. Others might interrupt the service frequently to pester you to upgrade to a premium plan. Overall, we recommend investing a few dollars and obtaining a paid VPN service. Free ones don’t cut it. After you’ve settled on a VPN service that works for you (an easy way is to click on the links beneath each mini-review) and signed up with your credit card information, then all you need to do is proceed to download the client software for your device. Log into your account after the installation is complete. Browse through the list of available server locations until you find those that are located in the UK. Some providers let you select a server based on country alone, while others let you select by city. A successful connection will normally be indicated by a green icon on your taskbar or a VPN symbol at the top of your smartphone screen. Now your connection will be anonymous and secure, and you’ll have a UK IP address that will give you access to all the British content you want. Why do I need an IP address from the UK? Advocacy body Freedom House says the internet landscape in the United Kingdom is “free”, noting that it “is considered to be a key element determining societal and democratic participation”. Access to broadband internet is a fundamental human right in the UK. This is backed by a commitment to allow access to the free and unfettered internet, bereft of content censoring or other abhorrent practices. However, torrenting copyrighted material is considered illegal in the country. There have been instances of copyright trolls flexing the law to gain settlements. Try to stay out of harm’s way. An IP address from the UK can help if you’d like to access the free and open web. Normally that’s not available to citizens of countries like Iran, China, Russia, and the UAE where state-appointed engineers impose all sorts of blockades to throttle access to sites. UK residents who are traveling abroad will find it useful to obtain an IP address from back home. This helps to access content like BBC iPlayer, Sky Go, UK Netflix, and ITV Hub. If you’re looking for a more detailed guide on how to stream UK shows while abroad, then our primer on the topic should help. Other use cases for a UK IP address are accessing online banking services and watching premier league football. DISCLAIMER: Comparitech does not encourage using a VPN to stream content illegally. Please consult local laws thoroughly before deciding to embark on this route. If you have any questions then it’s best to talk to a lawyer in your country of residence. Your IP address operates as a physical identifier of sorts, helping websites determine where you’re accessing the web from. But that’s just one (albeit popular) method. Another common mechanism is via Domain Name Systems (DNS) which act as a hybrid registry of sorts. DNS addresses are used to verify domain names using their IP address. When trying to access geo-restricted content, most websites will check where the DNS request is originating from. If both your IP address and DNS server don’t originate from a country that allows access (such as the UK for BBC iPlayer), the host website or app will block you. All the recommended VPNs in this list make sure that DNS requests are handled accordingly. After a successful connection to a VPN server, your DNS requests will also be routed through the same encrypted tunnel. Many of them offer DNS leak protection to boot. Therefore, it’s not possible for snoopers to monitor your web activity simply by examining DNS requests. Free VPN services ordinarily route your DNS requests through the encrypted tunnel but then use a public DNS service on the other side. This means search engines can track which websites you visit, thereby compromising privacy. Can I obtain a UK IP address without signing up for a VPN? There is an alternative option for getting an IP address from the UK. This is obtained via the Tor browser; a product conceptualized by the Tor project which aims to help people escape network surveillance and violation of confidential business relationships and privacy. The Tor browser is free and incorporates sophisticated encryption and anonymity standards. It’s popular with journalists, human rights activists, and whistleblowers as it allows them to hide their identity without a monthly charge. But the Tor browser is only viable for limited use. If you’re a blogger or whistleblower, then Tor can help. It’s a terrible option if you want to engage in online banking services or stream British content. That’s because all the sophisticated encryption makes it insufferably slow. However, if you’d still like to get a UK IP address with Tor, then this guide will break it down in more detail. Another option is to deploy a free proxy server. However, this is similar to the free VPN services we warned you about earlier in the article). Proxy servers also operate with download caps and shady privacy policies. Most streaming providers like Netflix have started to block proxies as well and others are quickly catching on. An additional problem is that proxy servers won’t encrypt your traffic the way a VPN does, so you’re leaving yourself susceptible to online monitoring by an ISP or other intrusive entities. The proxy provider itself could also monitor your online behavior. 2 Best VPNs for a UK IP address? 13 Can I use a free VPN for a UK IP address? 14 I’ve decided on a VPN. What do I do next? 15 Why do I need an IP address from the UK? 17 Can I obtain a UK IP address without signing up for a VPN? 8 Can I use a free VPN for a UK IP address? 9 I’ve decided on a VPN. What do I do next? 10 Why do I need an IP address from the UK? 12 Can I obtain a UK IP address without signing up for a VPN?